Marie-Galante offers a variety of fascinating places to visit, either on your own or with one of several companies offering mini-bus tours of the island. The charming town of Grand-Bourg is the administrative and commercial center of Marie-Galante. The little museum there called Au Mouillage, retracing the genealogy of the different means of transportation on the island since 1900, is worth a visit. Not far from Grand-Bourg, Château Murat and its windmill, built during the eighteenth century, are highlights for visitors to Marie-Galante. About one mile north, the Mare au Punch awaits. It is said that during the French Revolution, slaves who were fighting for freedom poured all the sugar and the rum they could find into the pond and set it on fire to make the biggest bowl of punch ever prepared. On the way to Saint-Louis, the Distillerie Poisson can be found. It produces the Rhum du Père Labat, considered the best Caribbean white rum. In its small museum, viewing historical artifacts can be combined with pleasure in a rum-tasting session. Proceeding north from the distillerie, the fishing village of Saint-Louis offers a pure Créole-style open market, and beyond, the peaceful and enchanting Vieux Fort River displays an incredibly rich environment of botanical and animal species and can be explored by boat. Ecological tours are available. 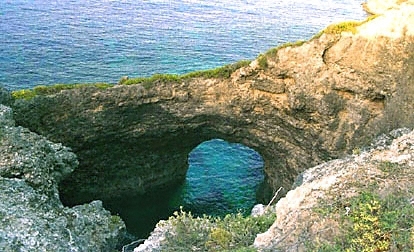 On the northern cliffs, a spectacular cove called the Gueule Grand Gouffre (Mouth of the Giant), opens onto the sea through a naturally sculptured gigantic arch. Please be careful by the edge, you don't want the giant to eat you. Further along the coast, the grandeur of the magnificent cliffs of Caye Plate offers the visitor an unforgettable sight. Inland, close to Bazaars Mill, the subterranean lake at Trou du Diable is another acclaimed attraction. With professional guides, it can be visited with climbing ropes. And finally, on the south-east coast, charming Capesterre, a traditional village of small white and red houses built around the church, is the starting point for several interesting hiking tours. Rouse Triton Windmill, north of Grand-Bourg. This incredible property attracts visitors charmed by its cut stone buildings and red brick stables. Bazaar Windmill, operational until 1954 has been beautifully restored. And Ballet Windmill was built on the spot where Christopher Columbus landed on November 3, 1493. The distilleries of Marie-Galante are famed throughout the Caribbean. Some claim that sugar cane originated in New Guinea, others, that Alexander the Great brought it back from India. Nevertheless, Christopher Columbus imported it to the new world. The tropical climate of the Caribbean islands proved to be ideal for the culture of sugar cane. To this day, Marie-Galante continues to offer the unexpected sight of traditional ox carts carrying sugar cane in from the fields, one of the few places remaining in which they are still used. Domaine de Bellevue, near Capesterre, has been in operation since 1821,and produces 2000 liters of rum a day. Distillerie Bielle, east of Capesterre, is worth a visit for its pottery workshop, which produces wonderful jugs and bottles. Please click here for a directory of excursions and sightseeing options.